218 399 passed Schwabhausen with RE32986, the 14:19 München Hbf - Kaufbeuren on 21 April 2009. This is a good spot for loco hauled trains with plenty of 218s on regional services, 218s in pairs on EC trains and 223s on ALEX workings. 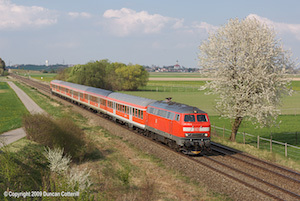 Augsburger Localbahn 44 leads hired Connex V146 on a westbound train of vans at Schwabhausen on the afternoon of 21 April 2009. Both locos are former DR V100s, rebuilt after reunification and given a new lease of life by the growth of open access operations in Germany. 218 462 raced south with train RE32990, the 16:19 Mü̈nchen Hbf - Kaufbeuren, at Weinhausen, south of Buchloe, on 21 April 2009. The loco was one of a number noted that had recently been repainted. 232 461 and 232 618 were paired up on train 45198 at Harbatshofen on the afternoon of 22 April 2009. This was one of the freights diverted away from Austria's Arlberg route to run via Mü̈nchen, Kempten and Lindau during bridge work at Landeck. 218 430 passed a field of dandelions at Mollenberg, south of Hergatz on 23 April 2009. The train was RB32896, a Memmingen to Lindau local. ALEX operate the 2-hourly München - Lindau service with new class 223 locos and sets of 5 or 6 coaches. The trains divide at Immenstadt with three coaches going to Oberstdorf behind a different class 223 while the loco from München and 2 or 3 remaining coaches continue to Lindau. 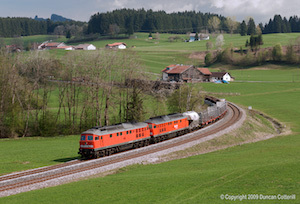 223 067 was photographed near Waltenhofen, south of Kempten with train ALX38702 on 24 April 2009. How satisfying to photograph a long train at this location! A typical 2-coach ALEX just looks lost here. 232 182 and 232 589 snaked around the curves at Heimhofen with westbound freight 45192 on 24 April 2009. This is one location where a two-coach ALEX train does photograph well. 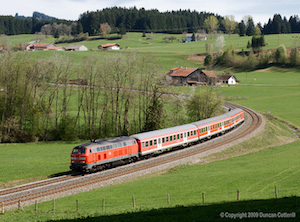 223 063 emerged from the bridge under the Stiefenhofen road north of Oberstaufen on the morning of 25 April 2009. I had the intention of photographing an ALEX train here but a red class 612 unit stood out so much better against the green landscape and blue sky. 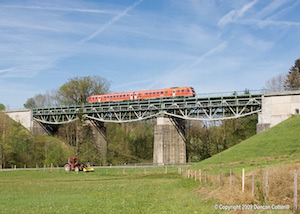 The unidentified 612 was working train RB32922 an Immenstadt to Lindau local over the Maria Thann bridge, east of Hergatz, on 25 April 2009. 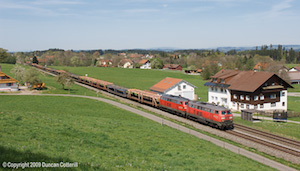 225 032 and 225 030 passed the village of Meckatz, west of Röthenbach, with eastbound freight 46685 on 25 April 2009. This was the only diverted freight that I saw with anything other than a pair of class 232s on the front. 232 182 and 232 589 emerged from the woods near Ellhofen, east of Röthenbach, with westbound freight 45192 on 25 April 2009. This spot is less than one km from Heimhofen but getting between the two spots by road involves a journey of over 10km. Two years ago, red DB Regio trains hauled by class 218 diesels were nothing unusual on the Allgäubahn west of Immenstadt but since the December 2007 timetable change they have become extremely rare. 218 202 was working train 75774 west around the Harbatshofen curve on the afternoon of 25 April 2009. This was a Saturdays only empty stock train from Kempten to Lindau. This was the shot I had in mind when I decided to visit the Allgäubahn for the Arlberg diversions. An unidentified pair of class 232s, probably 232 330 and 232 418, rounded the curve at Harbatshofen with westbound freight 45198 on 25 April 2009. It was worth going for this shot alone. The Allgäubahn is a double-track, non-electrified main line linking München with Lindau via Buchloe, Kempten and Immenstadt. It combines the three main factors that make for good railway photography; beautiful scenery, excellent locations and locomotive-hauled trains. 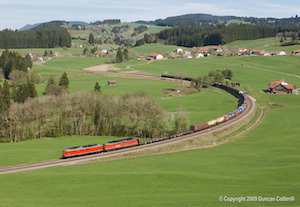 Unfortunately the locomotive-hauled trains on the most scenic section, west of Immenstadt, tend to be rather short, often only two coaches, and don’t make the best photographs in the line's wide open locations. The closure of Austria’s Arlberg line for a week in April meant that several freights and a couple of overnight passengers were diverted via the Allgäubahn, an opportunity too good to miss. I spent five days on the Allgäubahn before heading to the Czech Republic for a week (report here). Not much has changed since my previous trip, in August 2008 (see report for details), but there do seem to be a few more 218s on the Kempten-Immenstadt-Oberstdorf services and more ALEX services are formed of six coaches north of Immenstadt with three coaches continuing to Lindau and three running up to Oberstdorf. The ALEX sets are all consistently liveried now with the buffet cars painted in the same smart blue, white and yellow livery as the rest of the coaches. The ALEX locos and stock are also kept commendably clean and still look very smart after more than a year in traffic. Further north and east, 218s continue to work the majority of München – Füssen, München – Memmingen and Augsburg – Memmingen – Lindau services. The actual locos in use have changed though, with most trains worked by re-engined locos in the 218 4xx series. Muhldorf based locos still work the München – Lindau EC trains, Ulm locos work the two daily IC services from Oberstdorf and Kempten based locos work the loco hauled regional services. The remaining regional services are largely in the hands of class 612 units with a few class 628, 643 and 650 units noted on less important workings. Two daily and one dated passenger service were diverted via the Allgäubahn between 22 and 29 April 2009 but they all passed Immenstadt, where I was staying, in the hours of darkness. The passengers were booked to be hauled by pairs of class 218s but, as I didn’t see any, I can’t confirm whether this was the case or not. The freights were better timed with one or two eastbounds and two westbounds running in daylight on most days. A notable change from last August was that all but one of the booked trains actually ran and most were within a few minutes of right time or early. The regular freights ran with pairs of class 232s as expected but a pair of class 225s worked an eastbound train of car transporters on the Saturday and another pair of class 225s went east light engine in the same path on the Friday. I flew from Heathrow to München with BA then picked up a hire car from AVIS before heading west around lunchtime. First stop was Schwabhausen, between Geltendorf and Kaufering, where a number of loco hauled passengers were seen in a relatively short time. This is a good location for loco hauled trains with class 218s on regional services from München to Memmingen, Füssen and Buchloe as well as the ALEX trains and München – Zürich ECs all passing. There was even a freight, hauled by a pair of ex-DR V100s numbered Augsburger Localbahn 44 and Connex V146 (I had to check the picture to be sure but Localbahn is spelt with a “c”). What it lacks in spectacular scenery, Schwabhausen more than makes up for in volume. Next stop was Weinhausen, south of Buchloe, a spot better suited to late afternoon photography as the line runs north-south at this point. There were less loco hauled trains here but still enough to make it worth a visit. One notable observation was 218 492 hauling RE32613, the 15:07 from Füssen to München. Although this train is booked to be worked by a class 218, it should have been propelled, like all loco hauled regional services heading north. After bagging the required shots, I headed for Immenstadt and my base for the next few days, the Gasthof Drei König in the town centre. The weather had been sunny all afternoon. The first day of the diversions got off to a good start with the first train, a westbound lokzug consisting of two 232s and two 225s, passing Martinzell in the sun. RE32647, the 07:58 from Ulm to Oberstdorf turned up with no less than three locomotives, 218 431 and 218 488 on the front and 218 256 on the back. It’s booked to be double headed as it’s used to ferry a loco from Ulm to Immenstadt for IC2012 but it wasn’t clear why the third loco was required, especially as I didn’t see it again. I managed to miss the first eastbound freight, which was running very early, at Görwangs then the first cloud of the day obliterated the first proper westbound. Apart from the freights, most of the morning’s loco hauled passengers passed in sun but the afternoon was generally cloudy. The day was saved when the second westbound freight rounded the curve at Harbatshofen during a rare sunny interval. The weather forecast was for cloud everywhere, all day, except possibly close to the Bodensee. 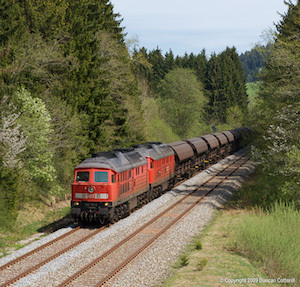 I spent the whole day west of Röthenbach and managed to get a handful of shots in the sun, although the majority of trains passed in poor light, including all the freights. A suicide on the line east of Buchloe caused some disruption during the morning with EC196 around an hour down at Lindau after being diverted via the main line to Augsburg. Everything returned to normal after a couple of hours. An excellent day in many respects, with good shots in sun of everything except the freights. I waited too long for the first eastbound, which eventually turned up as a pair of light engines, and missed the second eastbound which was running early again. The first westbound did turn up in good light but the second one passed during the only long cloudy period of the day. Passenger trains all ran as expected including RE32647 with its booked two locos. I had planned to spend my last day in the Allgäu heading north towards München, intercepting the freights on the way but the weather was so good and most of the shots I really wanted were west of Immenstadt, so that’s where I went. All four booked freights ran including a pair of 225s on eastbound car carriers in the morning and all were bagged in sun. EC196 ran with a single 218 instead of the booked pair but all other passengers were as expected. One other working of particular interest was the 14:34 Kempten to Lindau ECS, which ran with 218 202. Apart from the daily pair of EuroCities, this Saturdays only working provides the only opportunity to photograph a class 218 west of Immenstadt. With the change of plan, my departure from the Allgäu was much later than anticipated so I stayed overnight in Burglengenfeld, north of Regensburg and then drove into the Czech Republic the next day. 223061/063/067/068/070 It appeared to be the same same locos in circulation each day. Although it looked like it might be a bit of a disappointment until the last day, the Arlberg Umleiter came up with the goods (pun unintended) yet again. The opportunities to see heavy diesel hauled trains in good scenery are few and far between in Europe, particularly if you prefer older locomotives and this is as good as it gets. Even in normal circumstances, there is plenty of photographic potential east of Immenstadt where the ALEX trains are five or 6 coaches long, there are two pairs of IC trains in addition to the daily ECs and also a few 218s on Regio push-pull sets. Details of the class 218 diagrams is available from www.V160.de but you have to sign up as a member to gain access. Whether there will be another opportunity to photograph heavy freights on the Allgäubahn remains to be seen. There certainly don't seem to be any extended closures of the Arlberg line in the plan for this summer. However, the modernisation and electrification of the München – Memmingen – Lindau route will inevitably involve some periods of total closure when the München – Zürich EuroCity services are diverted via Kempten. In many ways these diversions are better than the freights due to their timings, allowing shots in even more locations. I can’t wait!